One of Wine Spectator’s top 10 picks for last year’s hottest wine destinations is Puglia, the heel and spur of the Italian boot, the rocky Eastern part of the peninsula bordered by the Adriatic and Ionian seas. Often called “magical,” Puglia is a narrow region packed tight with the same attributes that drew me to Italy several decades ago. It’s a charming, varied landscape with an enviable quality of life, amazing architecture, and best of all, first-rate wine. Puglia is rapidly becoming one of Italy’s most popular tourist destinations, as the region draws visitors due to it sunny climate, coastal resorts, delicious food, as well as its unique architecture and history. Puglia produces more wine than any other region in Italy, close to 17 percent of the national total. Why has it taken Puglian wines so long to receive the recognition that they are due? Significantly improved availability in the U.S. is in large part due to recent investments by several vintners to improve their operations. Famous Italian winemakers like Antinori and Avignonesi, as well as their Australian and American counterparts, have added vast sums of money in recent years. The same is true for many local Puglian vintners like Candido, Garofano, and Vallone, who have increased their investments and are employing stricter, up-to-date winemaking practices. Puglian reds, with over 20 DOC (Controlled Designation of Origin) wines are often named for the towns where they are grown. DOC wine production must follow precise rules and generally comes from smaller regions, within a certain IGP (Protected Geographic Indicator). DOC wines are particularly known for their climatic and geological characteristics and for the quality and originality of the local winemaking traditions. They must follow stricter production regulations than IGP wines. Some well-known examples, named after Puglian cities and towns, are Brindisi, Castel del Monte, Gioia del Colle, Martina Franca, (a town well worth a visit for its wrought iron balconies and sculpted portals), Ostuni and San Severo. 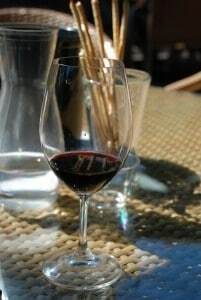 The main grapes grown in Puglia are the Primitivo, a clone of the Zinfandel grape, and Negroamaro, Nero di Troai and Malvasia. The best Primitivi are found around Manduria, while optimal Negroamaro comes from the Salento area, particularly around Salice, Guagnano and Copertino. The two grapes are often mixed together to obtain the best of both: the sweetness of the Primitivo and the slightly wilder, edgy quality of the Negroamaro. Reds from Puglia are highly regarded, while the whites have less cachet. However, white wines from the Murghe, a strange landscape spiked with holes and ravines sporting numerous small streams, are first rate. For example, Puglian white wines, like Locorotondo and Martina, are from the Murghe. They are clean and fresh- tasting, while those from Gravina are slightly heavier. All are great with fish. Many wines from Puglia are a great value. I recently purchased a 2012 Epicuro Primitivo IGT at my local Trader Joe’s. It cost $6 per bottle. The wine was well structured and described as “sunny” by one of our tasters. The wine received rave reviews from my family of four, as a perfect accompaniment to pizza. Gil Lempert-Schwarz, Chairman of The Wine Institute of Las Vegas, called it a “big-time, full-bodied masculine sort of wine with loads of black cherry-berry action and tons of concentration.” We also tried another Puglian red from Trader Joe’s, Layer Cake (www.layercakewines.com), which ran slightly over $10 per bottle. It was excellent as well. It is relatively easy to find first-rate Puglian wines in the U.S., as they are now marketed by many major importers. The Trader Joe’s example is not unusual—the same price and variety of wines from Puglia holds true at many wine stores, as well as on the Internet. If you are planning a trip to Puglia, there are many vineyards to choose from for a visit. At the heart of the Murgia is the idyllic Valle d’Itria, famous for its cone-shaped trulli, circular stone houses topped by conical roofs. Visit Locorotono, a favorite hill town, where you can gaze over vineyards and view the unusual looking trulli. The best time to go is late spring to early summer, as the beaches draw large crowds in August. And while early spring is not considered the typical time to visit, it may be a perfect time to explore Puglia blanketed in wild flowers. Marjorie Eisenach has traveled Italy extensively via numerous trips over the past 40 years, and resided in the country for nearly two years. She currently lives in Minneapolis where she teaches Italian language courses and helps American and British travelers prepare for visiting Italy. For more information, visit www.ItalyandItalian.com.